Earlier this year, TechTarget’s Information Security magazine and SearchSecurity.com asked more than 1,700 information security executives and managers to assess and rate the products deployed within their organizations. These responses were used to select the winners of the 2014 Readers’ Choice Awards. We truly value the fact that our customers are our biggest advocates. 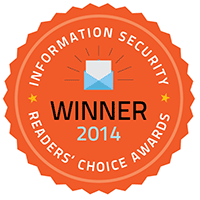 That’s why we’re very excited to report that Core Insight was named a 2014 Readers’ Choice Award winner in the “Best Vulnerability Management Products” category. For more on why Core Insight was named a winner, check out the full report. For an details on how Core Insight can help you eliminate vulnerability data overload and protect your critical assets, check out our Core Insight overview page!